← Is 3D TV bad for your health? So it turns out that Peter Jackson is shooting his Lord of the Rings prequel, The Hobbit, in 3D and at 48 frames per second. Virtually all filming for cinema is done at 24fps of course, and one of the great things about Blu-ray is that it brought 24fps delivery into the home, instead of the bodges used to show film at 50 or 60 fps. I reckon the jump to 48fps, if continued, will be the first great jump in 2D quality in cinema since the 1950s, when experimentation with large format filming started. 24fps is subject to judder. The eye can perceive the little jumps from frame to frame at this rate. Woody is moving rapidly upwards. The edge of the toilet and the corner of toilet paper on the roll are clear, while he is smeared. 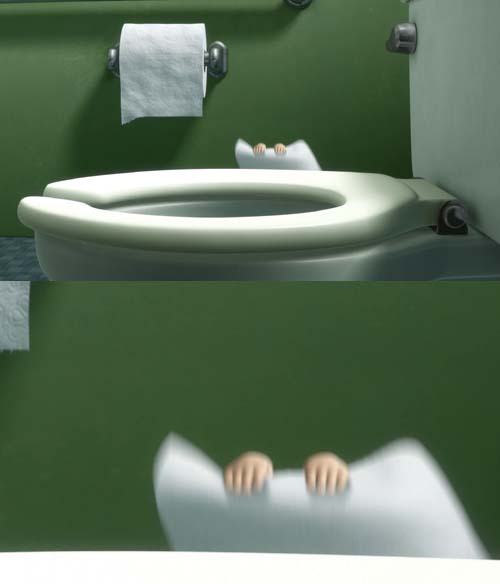 Pixar puts algorithms into its rendering software specifically to smear moving parts of the image to eliminate judder. Now, imagine the clarity that would be available if the frame rate were doubled. The eye has much more difficulty discriminating between two pictures seen 1/48th of a second apart than it does 1/24th of a second. Smoother, more fluid movement is generally claimed as the advantage of an increased frame rate, and there is some truth to this. That’s why frame interpolation motion smoothing systems have been incorporated in many displays. But in practice the real improvement will be sharper focus and greater detail of moving objects and of scenes during camera pans. The article linked above suggests that there are plenty of digital cinema projectors that will handle this higher frame-rate format. I hope so. But it does leave home entertainment behind. Blu-ray does not support 48p. Some display devices such as projectors may, but I don’t think the current HDMI standards do. HDMI 1.5 and High Frame Rate Blu-ray anyone? If 48fps filming and cinema production becomes common, the home theatre must follow. Not just because it is always good to have the same quality as the cinema, but because material shot optimally for 48fps may not look that good at 24fps. Which also raises the question: how will it look in the thousands of cinemas which use film? This entry was posted in 3D, Blu-ray, Cinema, HDMI, Video. Bookmark the permalink. 15 Responses to The next big advance? So, I guess the question is: has PJ diverted his project into a technological side-stream? Am I wrong in thinking that digital projectors are still in the minority at commercial cinemas here in OZ, and that almost no-one at all has a home cinema set-up that will be able to handle a 48fps transfer? So everyone will have to fork out for new equipment? How many films shot in 48fps, and taking a financial dive in home entertainment sales as a result, will it take to create enough momentum for people to be willing to pay to upgrade their kit? Technically, in the interim, how would 48fps even be transferred to a 24fps capacity in a way that wouldn’t completely destroy the illusion of smooth motion? 50i is pretty much the same as 48fps. But, obviously, with far lower resolution. Equipment is indeed a problem, certainly in the home and I’d be surprised if digital cinemas are equipped for 48fps. Could be wrong on that, though. 48 to 24 fps conversion probably isn’t too hard these days … if they bother to do it properly. Obviously half the frames are simply dropped. The remaining problem is the possibility of insufficient motion blur to hide the judder. But since nearly every frame of The Hobbit will be digitally processed anyway, they ought to be able squirt out a 24 fps version with increased motion blur. You’re correct, Stephen. 48 fps is very close to 50i or 50p in terms of motion. If 48fps cinema was shown on Australian TV (HDTV), it would simply be sped up 4% to match our 50Hz TV rate, the same as 24 fps movies are sped up 4% to 25 fps (50Hz) now, with each film frame spread across two video fields. This could be how blu-ray transfers will be done initially. Blu-ray at 1080i/50Hz, or 720p/50Hz. Both these formats are allowed on blu-ray. Putting 48 into 60Hz doesn’t go so well, however. A weird kind of pulldown will be needed. 1:1:1:2 or something like that. I think this is the most exciting change to film since the introduction of colour or widescreen (not that I was around for those 😉 ). I’ve been talking about the importance of temporal resolution for years. Watching 720p60 sports for example is amazing in terms of the extra sharpness, and ultra-smooth detail during movement. Even when the video is still, from my experience higher frame rate material can even give the illusion of extra depth, as our eyes can subtlety pick up that extra information. I have some great ESPN baseball that I use as a reference recording to show off 60p, and even though the spatial resolution is significantly lower than 1080i or 1080p, the high frame-rate (and bit-rate) always leave people blown away by how much better it looks than 24p or 50i based material. Correct me if I’m wrong, but don’t film projectors already show content at 48p to reduce flicker? Not native 48p of course, but the 24fps based content is frame doubled by the projector itself. I imagine this would be the same with professional grade digital projectors, but it’s not something I’ve looked into. If this is the case, the transition to 48p for cinemas should be a relatively easy one. Again, I’m just guessing and going off some old memories so correct me if I’m wrong! As far as 48p in the home, yep we’ll need new TVs, new players etc, given nothing does native 480p. However just like the projectors in current cinemas, my plasma already shows 1080p24@96hz to eliminate flicker. I turn frame interpolation off, so there is no new content, just 4 identical frames in a row. Perhaps 1080i60 or 720p60 will be able to show this new content when converted from 48p to 50 or 60hz, but as pointed out above there will always be sacrifices until native 48p is possible. Love it or hate it, 3D has a massive amount of gain from 48p too. At the moment directors are very limited in terms of how fast they make their panning shots, as the blur or judder introduced under motion looks awful in 3D, and probably contributes a lot to people feeling sick and getting headaches. Now 3D will look ultra-sharp and smooth, and directors will be able to do all sorts of interesting, fast panning cinematography, while retaining full detail at all times (as pointed out with the Toy Story frame this should be very noticeable). And finally I’d like to point out that this is another reason we badly need the NBN. If we have any hope of being able to stream such mega formats over the net in the future, we’re going to need all the bandwidth we can get, and only fibre to the premises has the potential to deliver this kind of content. I don’t understand why you think 50i/60i has less ‘Temporal Resolution’ than 50p/60p. They’re both exactly the same in terms of ‘Unique Images Per Second’. Spatial resolution, yes, you’re correct. 50p/60p has more spatial resolution than 50i/60i, due to the lack of interlacing and softening of each field to avoid interlaced line twitter etc. Sorry, just another thought to make my point. Remember, Temporal = Time. Both have equal number of ‘samples’ per second; unique pictures per second. It’s just that with interlacing, each picture only has half the vertical spatial resolution of it’s equivalent progressively scanned frame. Craig, doing 48p as 50i would seem feasible, at the cost of half the resolution of course. But it should be converted very carefully indeed. To ensure non-jaggie diagonals produced from motion adaptive display processing, rather than simply taking the same horizontal lines from each frame, they should have odd and even lines, alternating between frames. Simon, as I understand it film projectors do double frame, but to change to 48 sequential frames would involve some mechanical changes. 48fps 3D would be a new challenge for HDMI cabling since it would require the same bandwidth as 1080p96! It may be a typo, but you seem to be implying that the HDMI bitrate would be 60-70Mbps. Something like that would be required from the new (quadruple layer?) Blu-ray format, but not HDMI. It handles much, much more because the video is carried uncompressed. That’s why HDMI cabling has to be carefully carried. I have played a particular computer games at 24 FPS and >50FPS and the difference is very marked, as is the subsequent reduction in seasickness. I have seen people on video forums saying going to 48 (or 50 actually) FPS makes movies look “unmovielike” and destroys what cinema is all about. The new images look “plastic” and hyperreal. I think for the average punter and especially the younger generation, it will be all positives. Craig, in regard to temporal and spatial resolution with 50i compared to 50p (or similar) you are technically correct given there are the same number of updates per second. So when the camera is still there’s little difference. However given the amount of detail lost by interlaced blurring under motion, what I was attempting to say is you don’t really get the full benefit of 50 unique updates a second like you do with progressive, due to progressive having twice as much information being presented per update, and no interlaced artefacts. Compare native 60i to 60p with sports (if you can get hold of some good quality American reference footage) and the movement looks so much sharper and clearer, so I guess if anything it gives the illusion of better temporal resolution as well as spatial. This might also have something to do with the shutter speed they use for sport as that can also effect the clarity under motion. Stephen – I know HDMI can handle crazy bandwidth, I meant just as you suggested in your article that it will certainly require another revision to specifically support 48p. And as for Blu-Ray – another whole new format just after we’ve seen the launch of Blu-Ray 3D! That’s if it makes the transition to the home quickly. 48p might even be a feature the Cinema hangs on to for a while, before we see it incorporated into consumer equipment. Cinemas do after all need at least one benefit to make us want to go to the movies, given we now have the option of large screen HD 3D in the home. For the home market, I REALLY hope they wouldn’t consider going down the 1080i/50 4% speed up route. After decades of annoying PAL speed up that we’ve only just gotten rid of, the thought of bringing it back again in a different form would be really disappointing. I’d much rather something like a backwards-compatible Blu Ray 2.0 spec that includes increased frame rate options and support for quad layer discs. Adrian, I doubt that 48p will create that studio sheen that many of the frame interpolation motion smoothing systems create. This is a result, I think, of the averaging process between two real frames to make a new one. Filming/videoing at 48fps will eliminate that averaging. How much frame to frame ‘grain’ will persist as such a fast frame rate isn’t clear. Presumably it will be less apparent since our persistence of vision will average out some of it. But there is no doubt that 48fps will indeed by ‘unmovielike’. There is a certain feel to 24fps that is probably largely related to the almost subliminal sense of judder. As Craig knows all too well, some UK TV shows (eg. Top Gear) have segments in which they seek to create this feel by, effectively, delivering in 25p. They do this by simply repeating each frame twice as both the odd and even field, instead of the two separate fields. Of course, this also halves vertical resolution and creates jaggies. Remember, ‘movielike’ is actually an artificial feel coming from lifetime association with a slightly inaccurate medium. But I have no doubt that if 48fps takes off, some will hold it to be ‘unnatural’, when in fact it will be more natural than 24fps. Shane, I doubt very much we’ll actually see 48fps delivered as 1080i. If The Hobbit proves a success, then other filmmakers will emulate it and the Bly-ray organisation will respond with a new standard. This new standard will be orientated primarily to the US and Asian markets. The US in particular is very uncomfortable with 50 hertz stuff. So we will have a new standard. And, yes, it might as well include quad layer. More chance for movie makers to sell ‘premium’ versions. Correct me if I am wrong but I have a vague recollection that Chariots of Fire was shot at double the usual frame rate, at least for the slow motion scenes. May well have. Shooting segments at a higher frame rate when a slow motion presentation is planned is common. Not always double, though. Obviously on some movies a slow motion section is afterthought, and you can see the judder come in as the action slows.